Kamaal Allil earned his PhD in Business Administration in 2010 from Aligarh Muslim University in India. He has done his MBA in Marketing. He has two Post Graduate Diplomas, one in Human Resource Management and another in Information Technology. 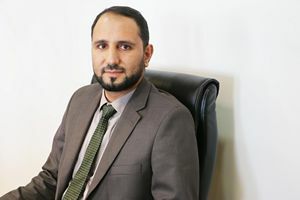 Kamaal Allil is an assistant professor in Marketing in Dhofar university in Oman where he is teaching undergraduate as well as postgraduate students. Previously, from 2011 till 2014, Kamaal joined Kalamoon University in Syria as an assistant professor. During that time, he was the Head of Marketing Department for three years and the Head of Management Information System Department for one year. Kamaal has an effect on business community not only through his teaching to bachelor and master students but also through his training to employees in local organizations. Within Dhofar University, Kamaal has contributed to the University at the college, department and convener levels. His current posts include a deputy convener in master program; a chair of CCBA Marketing and Publicity Committee; and a member of CCBA equivalency committee. Kamaal’s teaching style focuses on engaging the students in the learning process. He tries to simplify the subject matter and then motivate the students to share their experiences with their peers in the class and motivate them to develop critical thinking skills. At the master level, Kamaal tries to involve master student more in the process of learning. He gives the students in groups the chance to select one subject and deliver it in the class and push them to bringing theory together with practice by using several tools like local case studies, YouTube videos, educational games and brochures and other innovative ideas created by the students. Moreover, to combine theoretical knowledge with industrial knowledge, practitioner guests are invited to share their expertize with the students in the class. Also, an industrial visit with also done to provide student a practical perspective on the world of work and industrial environment. A range of marketing and management courses have been tough by Kamaal. He taught several marketing courses in BA programs, such as e-Marketing, Brand Management, Sales Management, E-commerce, Service Marketing, Marketing Research, Strategic Marketing, Promotion Management, Consumer Behavior. Also, he tough organizational behaviour in master program.